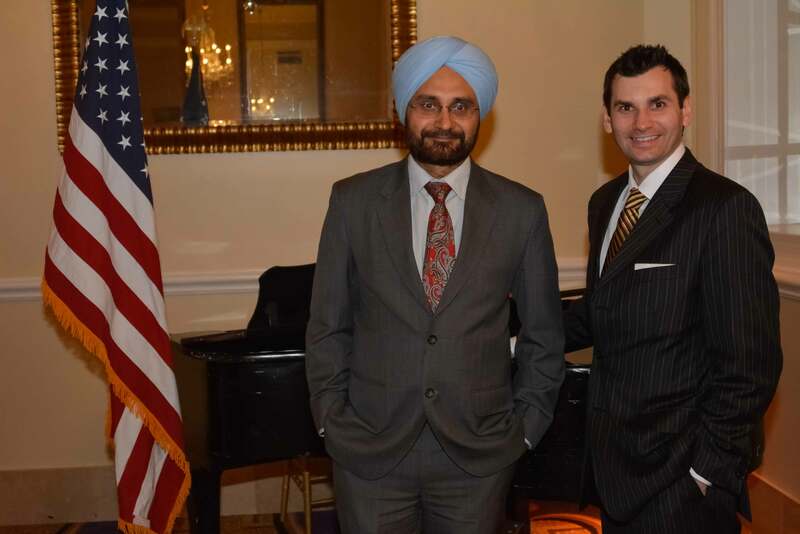 State Bank of India (California) sees great expansion potential in U.S.
State Bank of India (California) East Coast Leadership: Ranvir Singh (left), Vice President & Manager of the Washington, DC, branch, with Rokas Beresniovas. WASHINGTON, DC: State Bank of India (California) is the only subsidiary in the United States of an Indian bank. Started more than three decades ago, it has branches in California and Washington, DC. Rokas Beresniovas is a Vice President, who is in charge of implementing strategic business plan for SBIC’s DC market expansion. In a recent interview, he spoke to The American Bazaar about the bank’s operations, lending and clientele, among other topics. In recent years, SBI California has expanded its operations in the Washington, DC area. Could you tell us about your business in this region? What are your core areas in DC, as well as in California? SBIC was established in 1982. SBIC is a fully owned subsidiary of State Bank of India, one of the largest banks in the world and a Fortune 500 company, with controlling ownership by the government of India. We opened our doors in Washington, DC, in 2009. The DC office offers personal banking, as well as commercial banking. Most people see the name and assume we’re focused on businesses or customers that have banking needs related to India. However, we’re a full service bank that serves all kinds of business and personal needs. For personal banking, we offer checking, savings, and money market accounts. We also offer CDs and remittance services to India (without fees for customers). On the commercial side, we offer trade finance and commercial loans, including SBA loans. You are also lending money to local start-ups. What is the average size of a loan? The size of the loans usually varies based on the company’s needs. One of the most recent loans was for $250,000. The business created 30 local jobs in Washington, DC. However, we have done loans from $50,000 to $300,000 generally. It depends on the company and experience. We’re committed to developing the DC market and start-ups are especially important for this. Is there any other segment that you are targeting? We provide services that are competitive with other banks in the area. This means we have a diverse clientele of businesses and financial needs. We do real estate loans, start-up companies, business purchases, lines of credit, and working capital loans. The hospitality industry is a big one in DC, and so is investment real estate. But we’ve also had educational ventures, retail, and healthcare as well. For the Indian diaspora business community, we can also leverage assets in India, in order to help their businesses in US to expand. What percentage of your clients is Indian and Indian American? We do have a large clientele that’s of Indian descent, but the other half of our business does not necessarily have ties to India. They come to us for our competitiveness in the financial arena. What motivation do non-Indians have to bank with your institution? We’re a bank with a competitive record. In DC, SBIC Export Finance in the first quarter of 2015 was ranked first in the area. We were also listed in 21st place out of over a hundred banks for SBA lending in the Washington, DC market. Many international financial corporations started within a certain regional or national market, but the world is too globalized to rely on this model now. Banking serves a vast global network of clients. The DC branch is the only one outside of California. Have you considered starting branches in other states? Do have any expansion plans nationally? We see great expansion potential in the US. We’re looking to expand in the near future. The East Coast has a lot of trade and banking options. What are the greatest challenges of establishing an Indian bank in the United States? I personally think the greatest challenge is that, like any other nationally linked bank, people get confused as to why there is an Indian bank in the US. People assume we only service Indian clients or that we’re only working with institutions like the World Bank. We’re a community bank with a full range of banking services. There is a huge competition among banks and financial institutions specializing in remittance in the remittance business. How big is your remittance business? There is competition for remittances, but a lot of the services are online. For SBIC remittances, we offer personal service and encourage people to come into the office or call us personally. We also serve the local community, so they get to know us and the bank on a personal level. For our clients, we also offer remittances with no fees. About 1/3rd of the bank business is remittances.